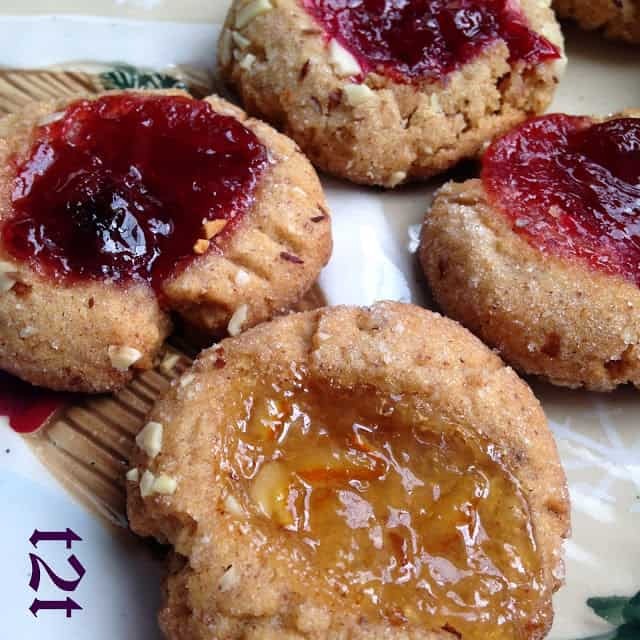 Jeweled Almond Butter Thumbprint Cookies are not only delicious, they’re really easy to make. Made with almond butter, almond extract, and coarsely chopped almonds. If that wasn’t enough, each cookie gets thumb “print” stamp of approval. Orange Elderflower Marmalade from IKEA. The almond butter used in this recipe is also from Trader Joe’s. Preheat oven to 375º F Line 2 baking sheets with parchment paper. Whisk together the flour, baking powder and salt in a medium bowl, set side. Combine the butter and almond butter in a large bowl, beat on medium high until smooth. Add brown sugar, 1/3 cup of sugar and continue to beat until light and fluffy, about 3 minutes. Add the egg and extract and beat until combined. Adjust the speed to med-low and add the flour in 2 batches; mixing until just incorporated. Combine the chopped almonds and remaining 3 tablespoons sugar in small bowl. Scoop out 1 tablespoon of cookie dough and roll into balls. Roll balls in almond-sugar mixture. Space balls 2 inches apart on prepared sheets. Make an indentation in center of each cookie with your thumb or the rounded side of a spoon. Fill each indentation with 1/2 teaspoon jam of your choice. Bake until cookies are golden brown, 10 to 12 minutes. Cool on wire racks. Almond Butter Filled Dates is another recipe featuring Almond Butter. 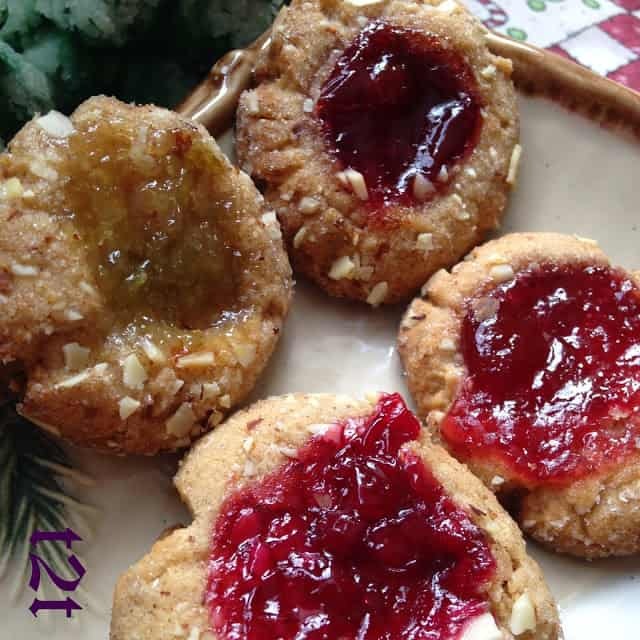 This recipe is made with Almond Butter and Cherry Preserves from Trader Joe’s. Gooseberry and Lingonberry Preserves plus Orange Elderflower Marmalade from IKEA.